You'll see a full spectrum of cutting-edge web development techniques, from UI and eye candy recipes to solutions for data analysis, testing, and web hosting. 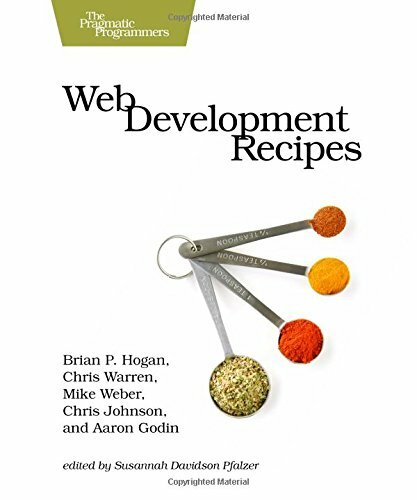 Whether you're new to front-end development, or you've got a few years of experience, you'll become a more versatile developer by finding out how--and why--to use these solutions in your next web development project. Chris Warren is a developer and support lead at Zencoder. He's been creating websites since teaching himself HTML in 1998, and after stints with ASP and ColdFusion development he came across Ruby and Rails. In addition to programming he enjoys cycling, photography, and going on adventures with his wife. Mike Weber is a web developer living in Minneapolis, Minnesota. He's been developing professionally since 2005, almost exclusively with Ruby on Rails. When not counting whitespace he enjoys running, swimming and golfing as well as spending time with his wife and dog. Aaron Godin is a programmer and designer. If he's not deep in a Rails application or programming in Ruby, he spends his time working with all things front-end. Besides being a Macophile, his other interests include electronic music, martial arts, skateboarding, and making fun of iPad commercials.